The short version: This struck me as a “statistics” way of exploring the grid, which is fine, but I’m concerned about how much we do or should be distinguishing the way the grid is used in algebra, geometry, and statistics. … The core design principles… I laughed. I think this confronts the student with a(the?) 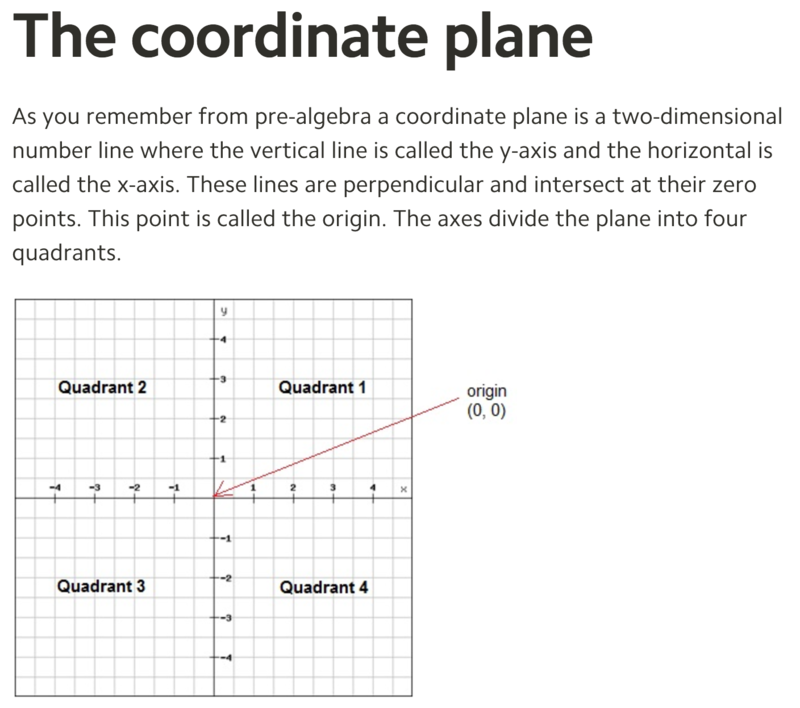 major mystery in school mathematics, where did the coordinate plane, or lines, come from? In this case there are fruits and there are perpendicular lines in a plane. 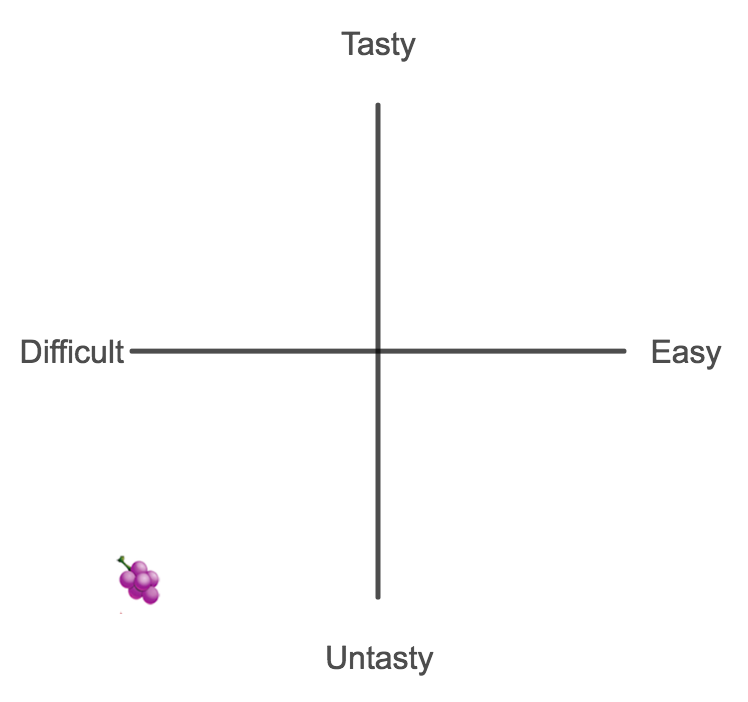 The student is asked to consider two fruit attributes as ordered. Numbers are ordered., the attributes can be assigned numbers. How? By a function that maps t-ness to numbers and e-ness to numbers .The student supplies that function, most likely without knowing it. The student and has long been conditioned to think numbers come with lines, they do not. A coordinates system is a function that maps points to numbers and the other way around. That function is constructed by somebody. Put the fruit ->attribute, the attribute -> number and the coordinate function together and you have the mapping of fruits to points in a plane. Generally students have not seen functions, and hence the mystery. It started with “numbers as points” on a number line. When a coordinate system is constructed by a computer there is a function some place in the code. Why not expose that process, and take it all the way back to the number line? I love this one. Is there a way you could make the dynamic text on slide 6 pop out a bit more? I didn’t notice it changing as I dragged my two fruits around. I love this idea – though I can’t get Fruit Ninja out of my mind when I look at it. I’m sharing this with the third grade teachers I visited today and hopefully we’ll use it sometime! 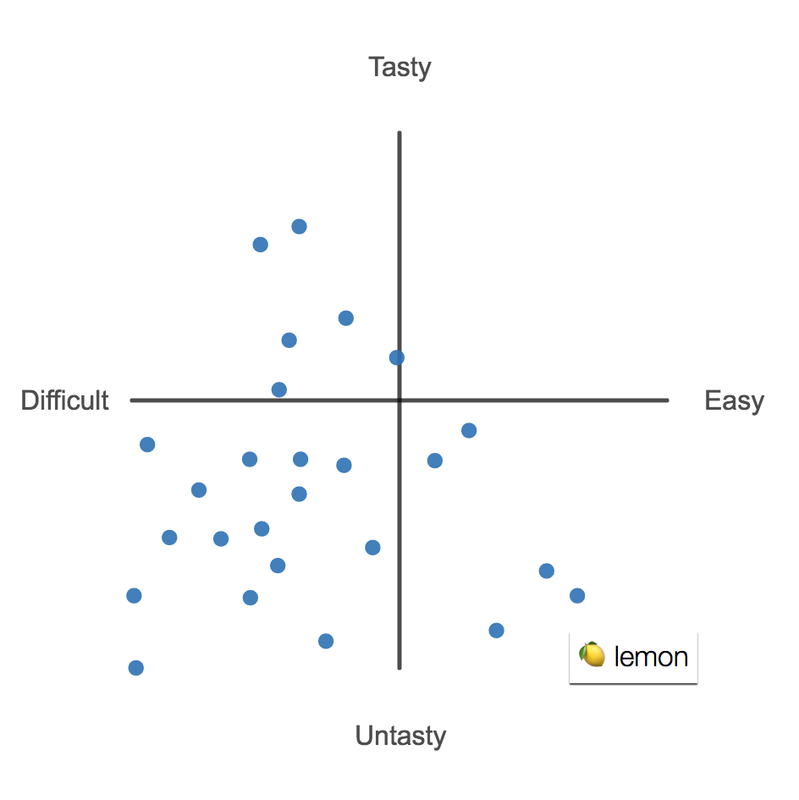 Thanks Dan and Desmos for these creative and fun ideas. I’d love to see this extended a bit further for an intro stats course. “Controversial” is just variance in the measurements. Great way to introduce a topic that is really dry in most text books. I think this is a wonderful task. While I like the elimination of the precision of the coordinate plane by removing the grid lines, I think you can deconstruct the abstraction even further. If I were to use this to introduce students to the coordinate plane, I think I’d build up the need for a plane first. I believe there is a rich opportunity for students to jump to a two-dimensional plane, and I think that is overlooked with how the task is currently presented. Thanks for sharing all of this. 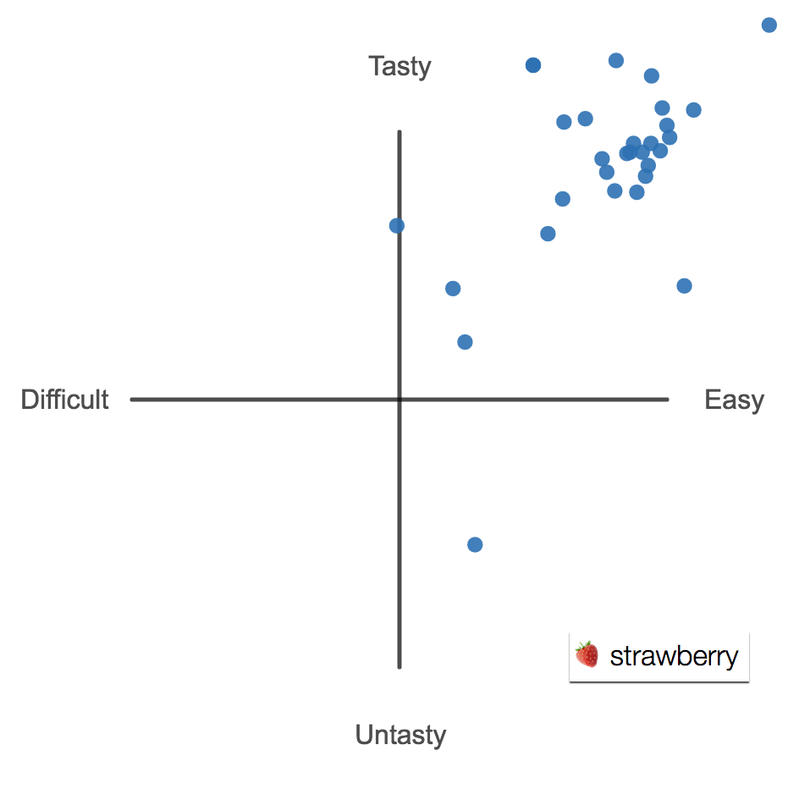 Keep up the great work, Desmos! Love it. Similar to David’s suggestion about variance, this probably deserves its own lesson. I gave it a shot a long time in a lesson I regret for obvious reasons of sexism and objectifications, but I still like the illustration of the coordinate plane’s value. The dot plots don’t reveal anything all that interesting by themselves, but when you plot them against each other, the association pops. It may be useful to realize there is another direction to be explored here, and that is the attention that should be paid to the use of undefined variables. All of us need to think about the use of “apparent mathematics” in explanation or illustration. 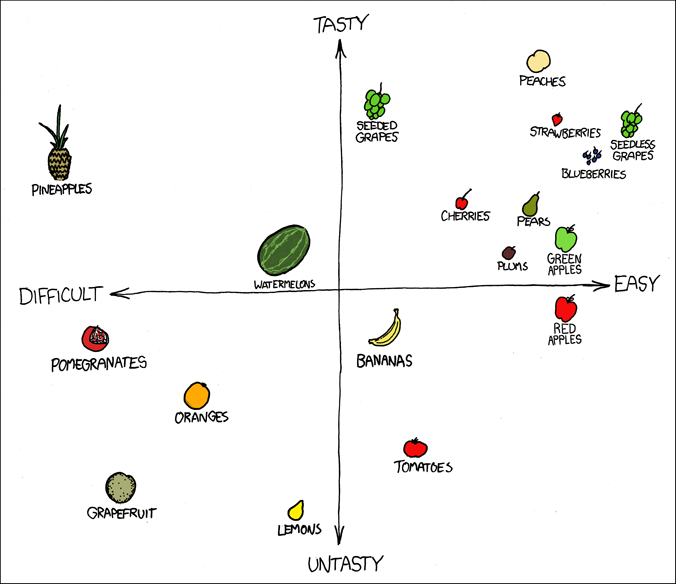 Characterization of fruit with undefined variables is probably harmless, but the use of apparent mathematics it illustrates is not. Now is a good time to think about graphical “tricks” with apparent mathematics in information display. For a good case study I suggest following the google trail of “Mathematics as Propaganda” by Neil Koblitz to Serge Lang and Samuel Huntington. It takes you back to 60’s to see mathematics playing the star role in the real world. The issues it raises on the use of mathematics are still relevant in the application of social science to education. As per request, here is an attempt to clarify my thoughts. I’d like to hear reactions. It is difficult to understand mathematics, but it is one of the few ways students can see a large payoff from the struggle to understand. Using undefined variables as coordinates, displayed or not, is deception. Mathematics resides in the graph of the quantitative relation of measures of two fruit attributes, but I cannot see a way to measure or derive numbers for coordinates of undefined variables, and hence they are not quantitative. They are opinion. Mathematics is a glimpse of both the difficulty and the possibility of understanding. Circumventing aspects that make it so leaves unique opportunities on the table. Students also need to see how the appearance of mathematics is used to lend undeserved weight to arguments. I am an educational studies student from Munich and I am currently participating in a seminar about teaching Math in English. I just found your blog and I really like your method of teaching the coordinate systems. But I’ve got a few questions. How much does the understanding of your students of coordinate systems improve by teaching them with the Pomegraphit method rather than teaching the regular way? Do you use this method only to introduce the topic? How do you arrange the transition from this method to using numbers? Thanks for the questions, Katrin. I haven’t run any specific study comparing this approach to introducing the coordinate plane with any other. I tend to a) draw inspiration from the Freudenthalian work on “progressive formalisation,” and also from the fact that I can always add the numeric coordinate plane. But I can’t subtract it once it’s added. 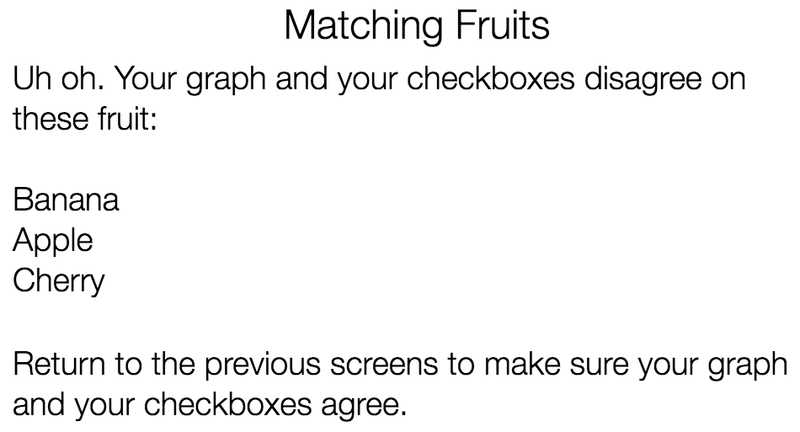 I give them a single fruit on the coordinate plane. I ask them to “send a text message to a friend that precisely describes the location of that fruit.” They find it challenging. They rely on imprecise language. Then I add a grid to the plane and ask them to repeat the exercise. They feel something like relief. The grid is a tool to enhance their communication. They still tend to say things like “four left and three down,” which I need to help them formalize to (-4,-3). Hi Dan, thank you very much for your answer. I just recently found your blog and am planning on using demos for a few projects this fall in a class I teach. I am a high school math teacher in MN and teach College Alg/Trig this fall. Love your blog and ideas about coordinate plane, I will definitely be using some of these ideas for a graphing project we will do. I love this. I’m wondering if you have any ideas of a light context or a full lesson that might present in such a way that would make Cartesian coordinates difficult and drive students to discover the polar system. Why not a circle centered at the origin? Both the x = sqrt(1-y^2), same for y, coordinates are singular at +1 and -1, and hence difficult to evaluate by hand. Just try to evaluate sqrt(1 – x^2) near x = 1. All you need for polar coordinates is a compass and a ruler to fix the radius, and blank sheet of paper. The practical computer approach hides the difficulty in Cartesian coordinates by numerical evaluation of power series expansions of the circular functions (sin and cos). For graphics the pixel map is generally Cartesian and polar coordinates are mapped to it. Your question brings out a nice collection of math, computation, and technology. Thanks to Dan for providing the forum. Hi Ross, thanks for the query. We don’t have anything like that currently, but we’ll talk about it.